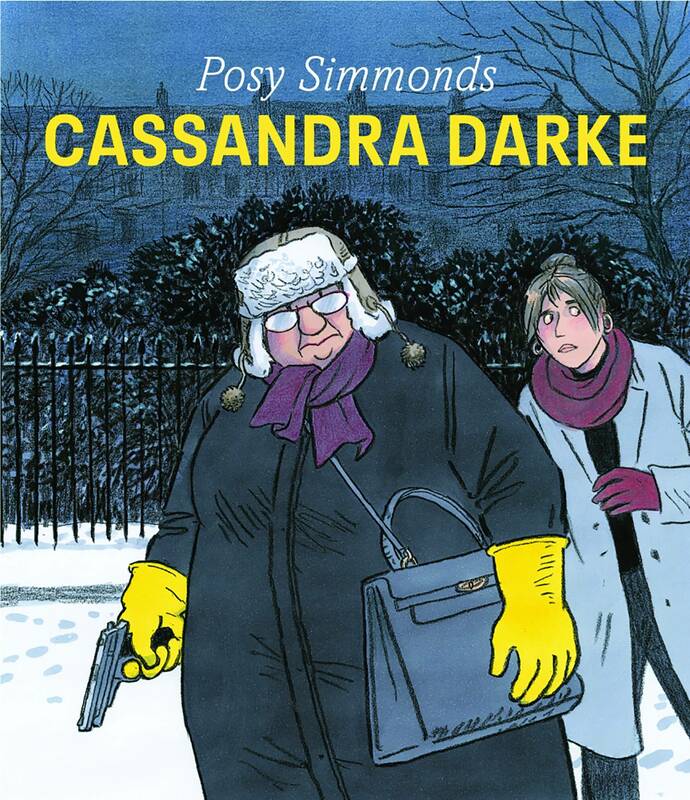 Cassandra Darke (£16-99, Jonathan Cape) by Posy Simmonds. On Friday November 17th 2017 a woman’s body was discovered in Surrey woodland by a couple who were walking their dog. This we are shown in a newspaper clipping on the very first page. It will not impact immediately upon disgraced and perpetually disgruntled London art dealer Cassandra Darke, her estranged family or her increasingly far fewer friends, for they are all, each one of them, obliviously unconnected. A gripping, warmly and flavourfully rendered master-class in behavioural self-justification, plot precision, dramatic irony and visually delicious comicbook craft, this comes courtesy of entertainer Posy Simmonds MBE, the creator of British classics TAMARA DREWE, GEMMA BOVERY, LITERARY LIFE and MRS WEBER’S OMNIBUS. And this, her first new work in a decade, is another belter, with the most exquisite and varied tableaux. 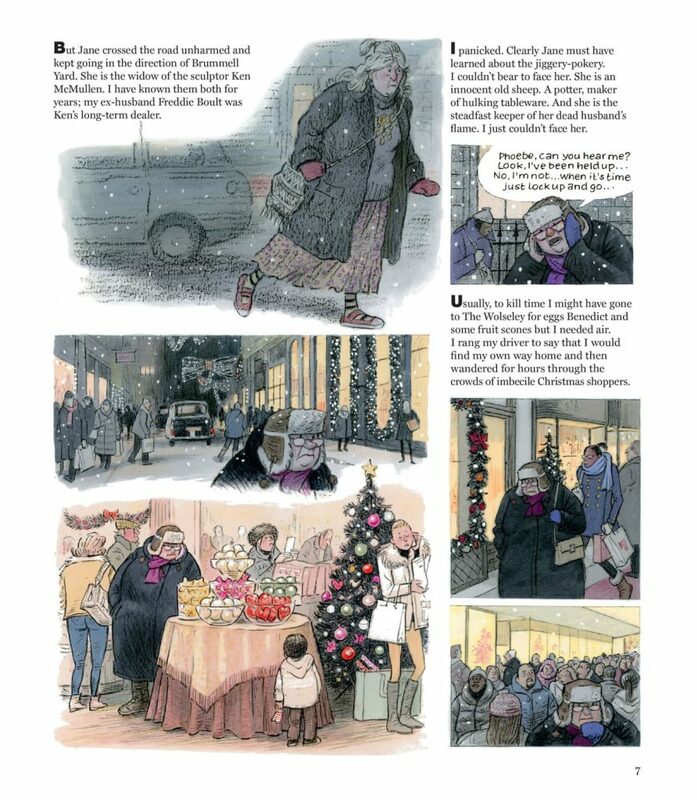 Set in the run-up to two London Christmases – and flashing back to a year’s crucial events before either – the pages glow in the December snow, with store-front window displays luring in bag-burdened shoppers, all clad in scarves or clutching their collars closed. 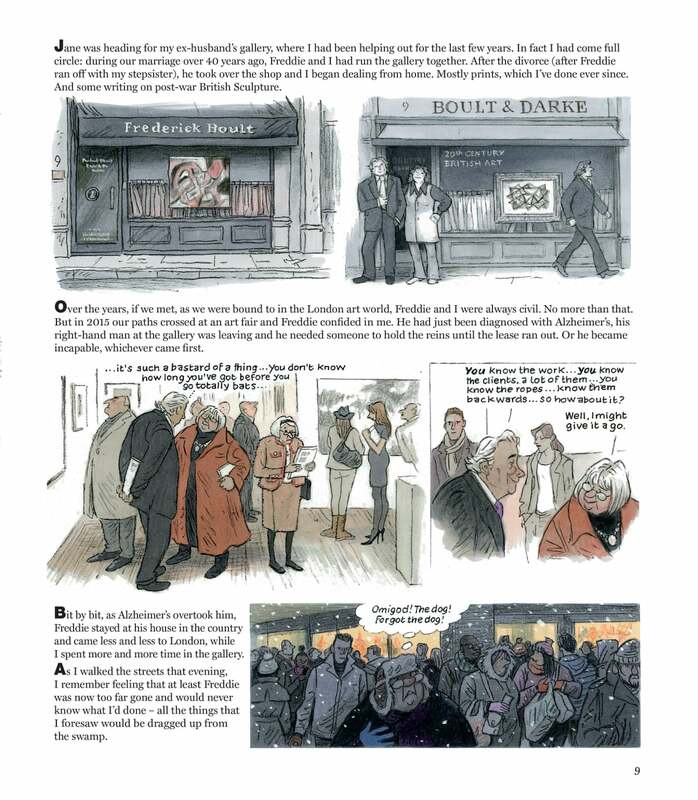 One of those is Cassandra Darke, decked out in a boiler suit, thick boots and Trapper Hat, though she was only in search of macaroons from Piccadilly’s Burlington Arcade, on a brief break from the gallery which she manages for her ex-husband. He’s been semi-retired for a while now, with Alzheimer’s. Cassandra agreed to return even though Freddie had run off with her stepsister Margot – hence the divorce – because she’d got over him (and it) almost immediately. Still, things aren’t so serene when it comes to Margot, the sons they had together, and especially not their daughter Nikki. That… became personal last year. Things aren’t so serene, either, once Cassandra spots Jane McMullen – wife of a deceased sculptor whose works Cassandra has traded in – crossing the road on the way to the gallery. Jane had been pestering her all day with emails and phone calls (so far evaded) after a dinner during which an art collector and his wife had cut Cassandra cold then spent all evening muttering in Jane McMullen’s ear. And Cassandra knows exactly what that’s all about: her “jiggery-pokery”, as she puts it, has finally been rumbled. We’ll return to the plot twice more, but I love the contrast between the two women, both of a certain age. Stocky Cassandra’s tightly dressed like a Giles character, grimacing away, her sour, disapproving mouth with its pressed, thin lips forming a central beak beneath glasses worn so as to signify a disdain of their own. Jane on the other hand is hat-free with long, jumbled grey tresses which her quarry refers to as a “rats’ nest”, her dress, jumper and loose woollen overcoat all flowing more freely: lots of comfortable, more natural textiles. 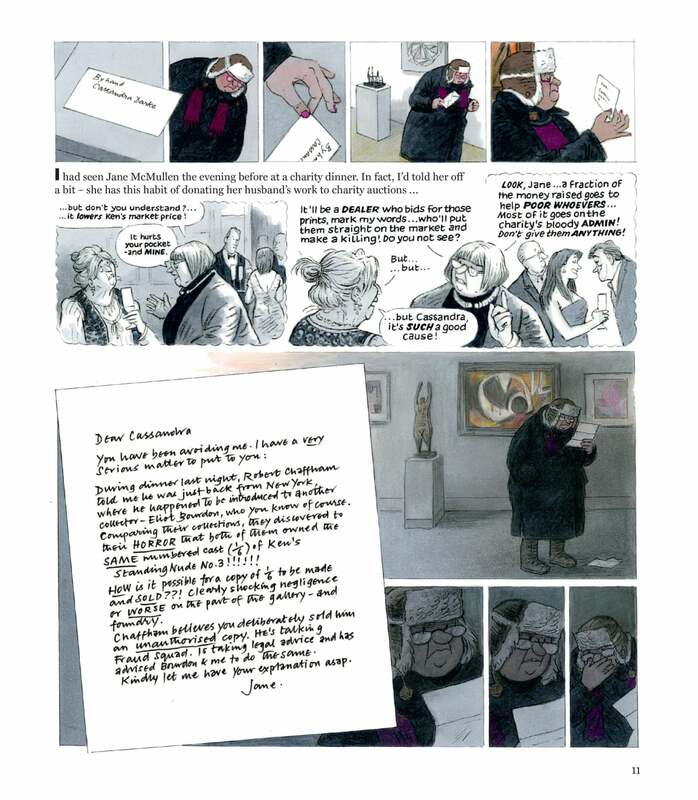 I remember when Comics Laureate Hannah Berry was drawing her own exceptional, packed crowd scenes towards the climax of her wicked media, socio-political and pop-culture satire LIVESTOCK, and the sheer masochism, as she saw it, of doing so. Blow up the final page of interior art accompanying that review for one of those crowd scenes and oh dear, there’s me, bottom left, beaming with enrapt adulation! 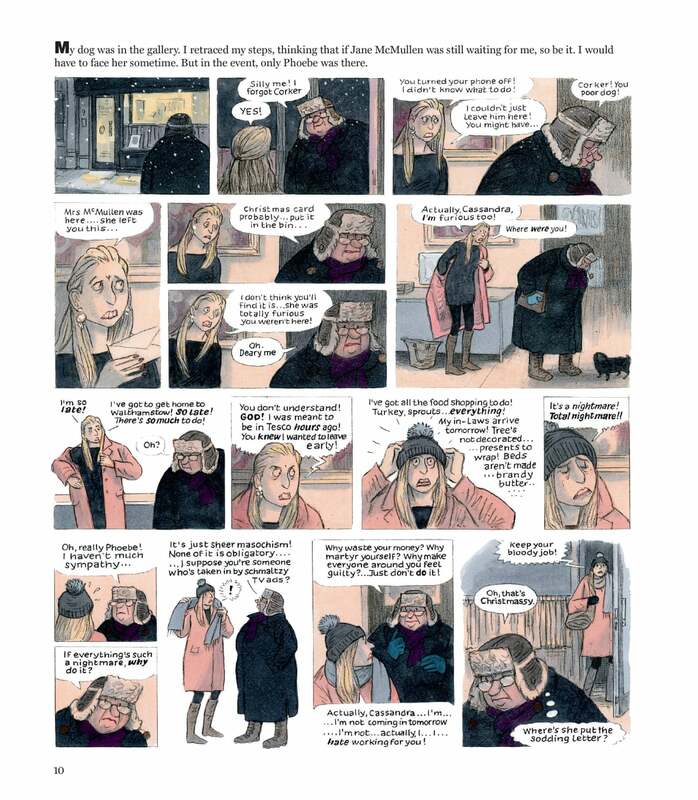 My point is, look at this full-page Posy Simmonds accomplishment, with its vanishing-point perspective, and its detail which only diminishes as the human eye can take in no more! 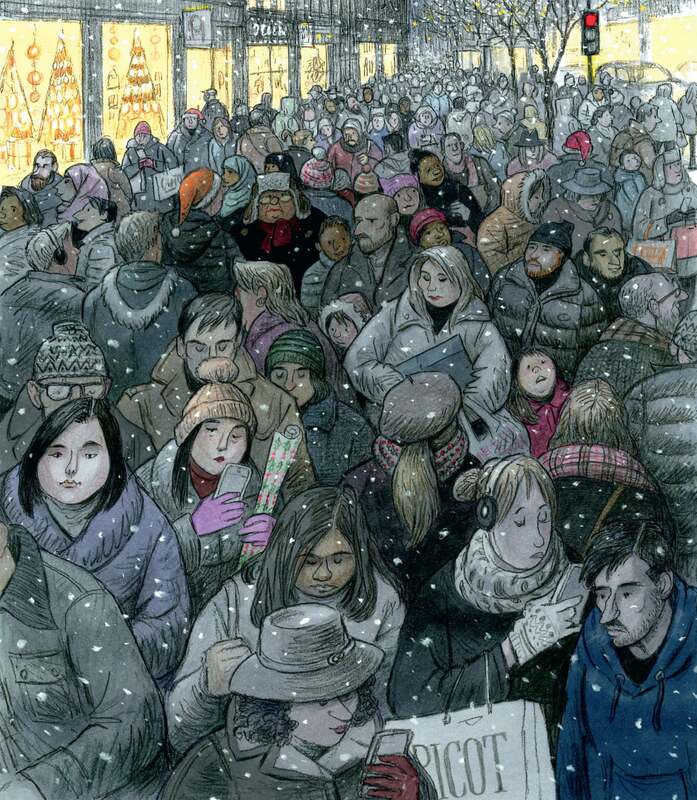 At the flock’s front, instead, it’s almost as if the human flood is upon you, about to sweep you away down the street when actually you desperately need to get to the fourth shop ahead on the left-hand side. Back to the plot and, as she predicts of herself, Cassandra comes a-cropper, busted for selling two collectors the same numbered cast. Fast-forward a year to December 2017 and although she avoided a jail sentence, the disgraced gallery has closed, she’s been forced to sell her second home in France to pay for the damages and legal fees, jettison her driver and housekeeper / cook, and been reduced from nipping down to The Wolsey for eggs Benedict to eating ready meals alone, taking public transport and walking her own dog. Still, on the whole, she is contentedly self-contained. Until, that is, her ex-husband’s Memorial is announced. Cassandra didn’t attend the funeral for multiple reasons that Simmonds is so astute in understanding – Posy’s very good at getting into people’s heads – but she is tempted into attending the Memorial, albeit covertly, watching from the gallery above the main congregation. Once more the social observation flows freely – one of the wealthy, for example, has a “glue-do” of hairspray – but mostly Cassandra is left to reflect and it is here where we begin to learn her true heart. In her own words she’s “old and fat” and actively contemplates suicide in forensic detail, by freezing to death in her now derelict garden, so as to avoid her ex-husband’s Alzheimer’s, and the hoists, ramps and grab bars she would need during her slow, lingering death in any twilight home. It’s when Cassandra gets home that the shocker occurs, when the true plot finally reveals itself. The alarm to her front door doesn’t bleat (so isn’t set), there are granite chips from the garden which she crunches on down the hall, as well as inside the back door to the garden which is, thankfully, locked. Immediately she suspects burglary and tears round the house but nothing is missing. Then, with relief, she imagines it must be her weekly cleaner, nipping outside for a cigarette and dragging the gravel in on her shoes… except that she hadn’t noticed until now. 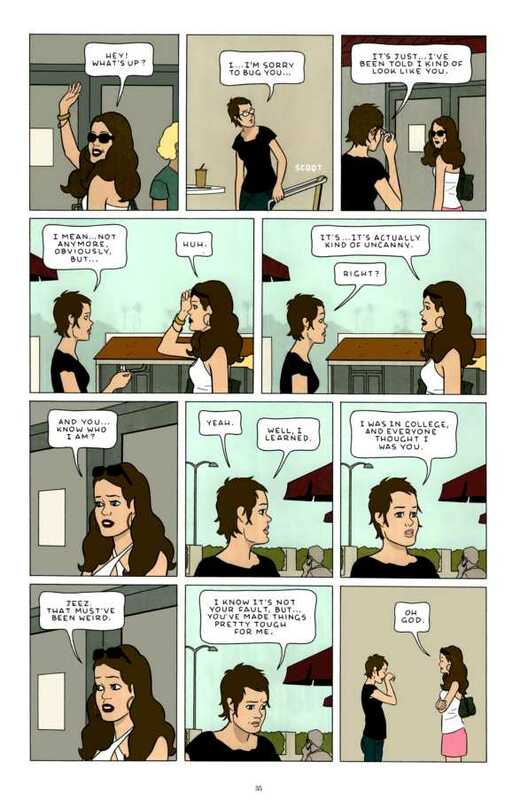 Then a more paranoid explanation kicks in – one involving Nikki, her ex-husband’s daughter who in 2016 had begged her for lodgings in the separate basement flat, and money to finance her art projects. As I have intimated, that didn’t end well. Perhaps Nikki had returned with copied keys? So Cassandra tentatively journeys downstairs. Nothing seems out of place since it was cleaned up a year ago. But there’s a grubby towel in the bathroom bin… and, under it, lies a glove, a gun and several rounds of ammunition. 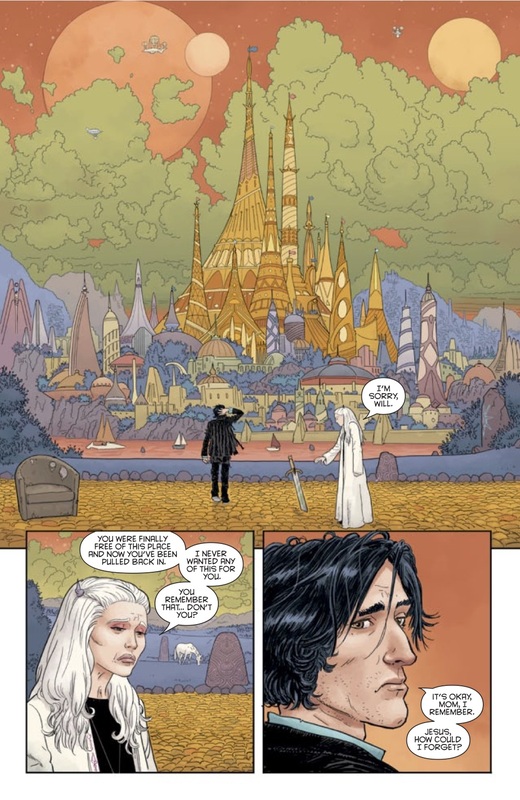 By contemporaries, Quinn was referring to Posy’s prose counterparts (Posy is overwhelmingly read by prose readers who don’t imagine or often acknowledge that they’re reading comics! ), and he is 100% on the money. To this I would only add that Simmonds here also excels her peers in television in terms of the behavioural and crime-driven, evidential logic. This is immaculate. As we flash back to those crucial events of 2016 involving Nikki, her imaginative, crusading art projects, a pivotal hen night and its multiple repercussions, then flow consequently back to the present, every element laid early on comes into play, from text messages sent to the wrong mobile phone (sent erroneously but not accidentally, and that is so key!) 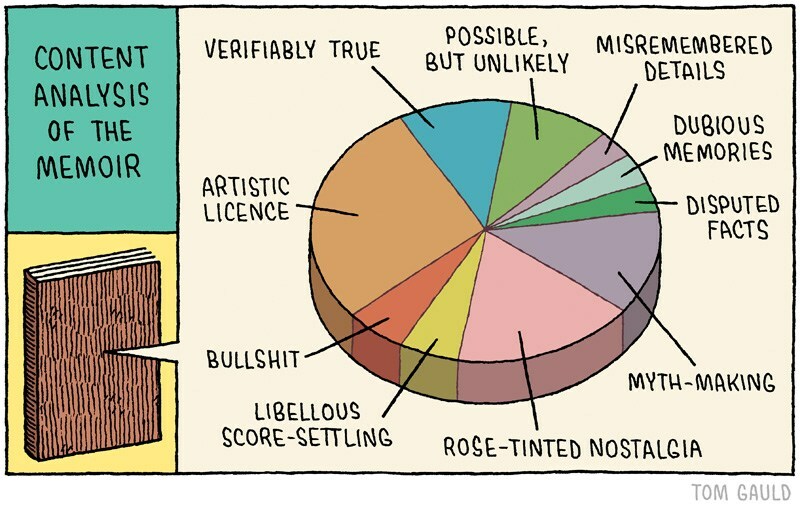 to Cassandra Darke’s initial, privileged and self-serving dismissal of charities, and the homeless, her contempt for Nikki’s specific staged social media campaign, yet also Darke’s renowned skills when it comes to analysing clues as to a painting’s provenance, its origin and so authorship. That the gun (and other vital items) had, we discover, come into her hands through such complex, convoluted and unorthodox ownership – along with her own previous conviction for crime – means that this could not play itself out in anything close to an easy conclusion by calling the police. It does so instead through such deviousness and daring that only a woman who has outgrown self-interest and caution for her own physical safety could muster. Even her own physical weight, of which she is self-conscious, pulls its own here. Let us say nothing of her dog. Yes, you will see and come to understand Nikki’s side of things in full, and I warn you that it grows pretty grim when men become involved. We may begin in posh Piccadilly and cosy Chelsea, in the sort of society for which a funeral is not enough and a Memorial must be held too, but that body was found in Surrey. Rodney is a very curious young boy. If he’s not examining creepy crawlies with a magnifying glass he’s usually watching the seaplanes landing on the nearby lake through his binoculars. Sometimes he’s covertly peeking at the neighbour hanging out washing through the gap in the fence, or standing on tip-toes, peering through the keyhole, to try and see what’s happening on the other side of a door. 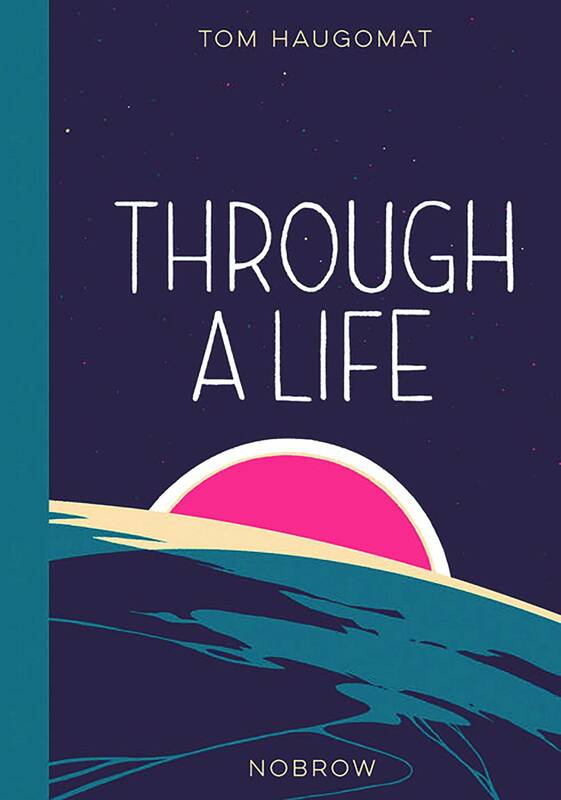 Sparsely illustrated pages of crisp design plot the trajectory of Rodney’s life at approximately a page per year: the discoveries, the successes, the failures, the high points and the lows, each a perfectly encapsulated point of time that we get to witness in its entirety. You see, this is a very unique take on a life story for we the readers are not simply there to watch, but also to experience it exactly as Rodney does… to partake through his eyes. 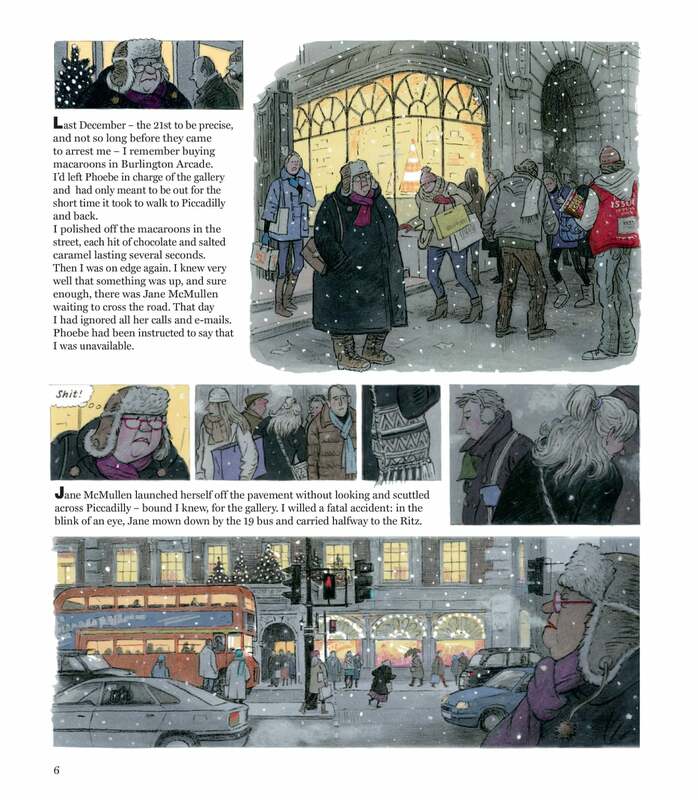 Presented in a simple yet ingenuous format throughout, with a scene on the left and then Rodney’s view of it on the right, each double-page spread is a construction that gives us the perspective from both outside and also within, which only when viewed together gives us the whole. 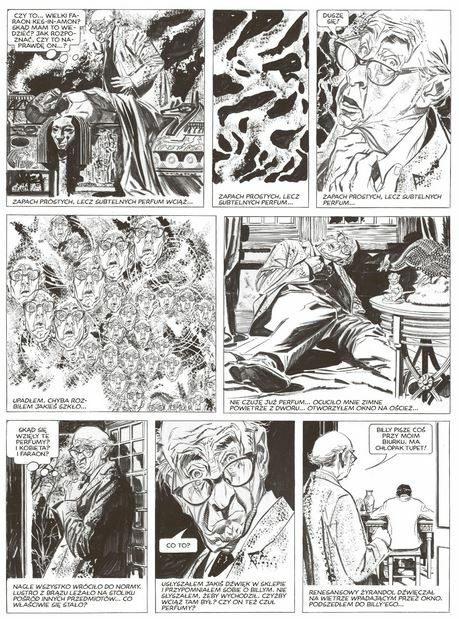 Sometimes it is Rodney peering through a door on the left hand page over to what he can see on the right, other times it is him intently reading a book on the left, with a close up of the page itself on the right. 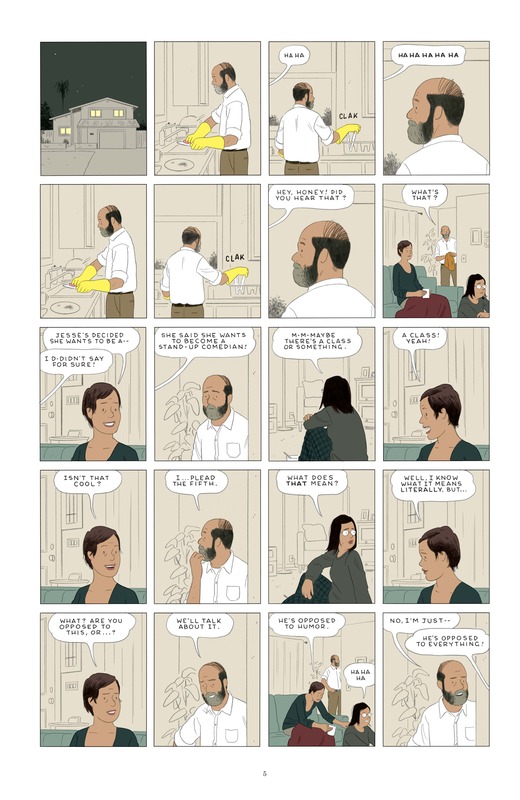 Thus you get to see what Rodney himself is experiencing in each moment, but also the bigger picture, which on occasion reveals a crucial aspect that Rodney himself may have missed. Being presented with both perspectives like this sounds like it should be intrusive, voyeuristic even, but in actual fact it is far from it, instead creating a real sense of intimacy. 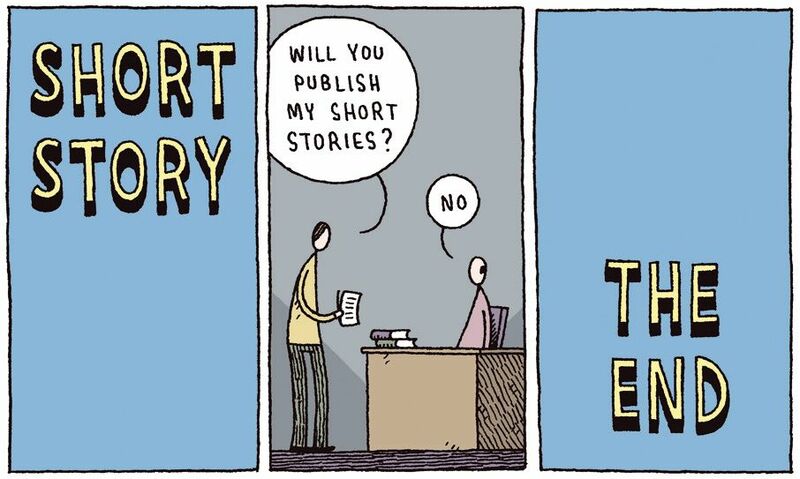 More like a story being told to you in hushed tones, almost a whisper, by a close companion while you’re both sequestered away in a secluded spot. 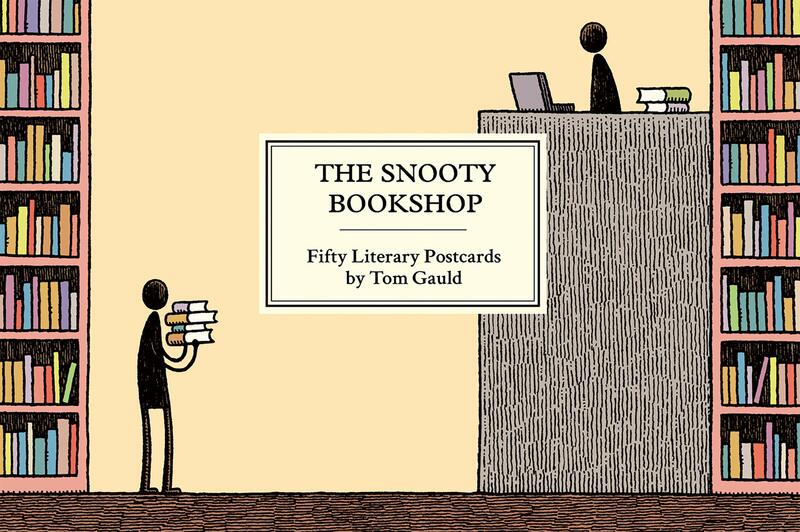 The Snooty Bookshop: Fifty Literary Postcards (£12-99, Canongate) by Tom Gauld. The problem with that is it’s almost impossible to convey through quotation, so I selected some choice interior art for you instead. Some of all-time favourites are in here. Well, tear them out and send them to somebody! It’s a book of postcards! Alternatively frame the fiends, and arrange them artfully around your house where they can cause the most mischief: convulsive with laughter is ill-conducive to an accurate aim in the loo. Hmmmm. Arrange them around someone else’s house, then. 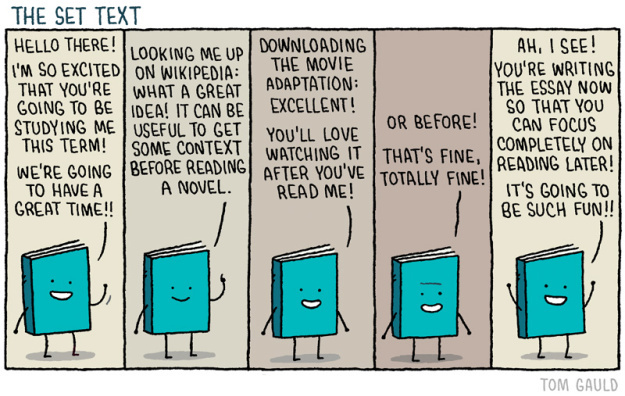 All the above titles reviewed in much greater length and depth. You’d never fit this on the back of a postcard as it is. “Wait. I think I’ve got a quarter. Will you blow me for a quarter? “Come on, man! I’m all ready! I think face of thunder would best describe Russ’ face in response to his ‘friend’ Kurt’s, as he perceives it, hilarious banter. In retrospect, Russ probably didn’t do himself any favours drunkenly mentioning how their school friend Warren had paid Russ to lie on top of him and hug him. But then neither does Kurt know that Russ is in fact gay, albeit very much in the closet, unlike Warren, who is about to be forcibly evicted. Still, with ‘friends’ like Kurt and his sidekick asshat Willie, who for some reason best known to himself (and us the reader) Russ has chosen to hang around with during the summer, Russ is going to have learn to keep his secret under wraps if he wants an easy life. Here’s the publisher’s slightly hyperbolic synopsis of David Small’s latest tale of emotional character torture. Sounds a lot like a not inconsiderable number of comics to me… Did the publisher really need to make the obscure cinema correlation? Maybe the hypewriter is a cinema buff? Blue balls, on the other hand, was a term I’d never heard of until I lived in the USA for a couple of years. It’s, well, let’s just say it’s a highly dangerous condition that if not treated rapidly can lead to the sufferers, usually immature young males, exploding. So no bad thing, then, if they are idiots like Kurt. Anyway… all you really need to know is that David STITCHES Small is back once again putting his characters through the wringer. 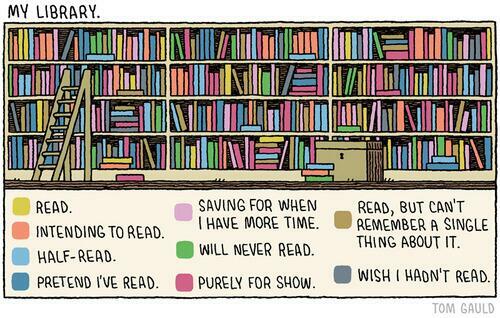 All of them, pretty much. I certainly think you’ll be able to gather from the above blurb that Russell is not having an easy time of it. 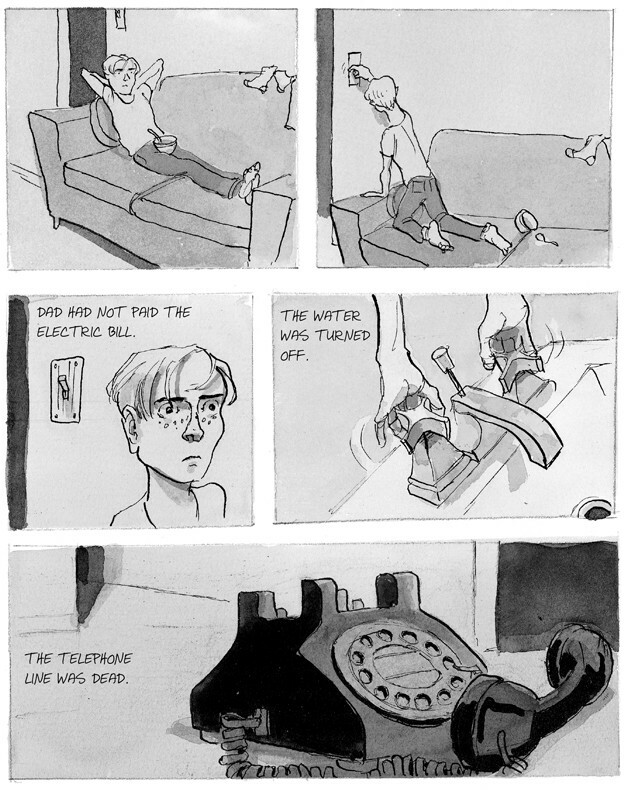 Indeed, the prologue of a young Russell just staring vacantly at his own reflection in a bauble on the Christmas tree – whilst his parents’ climatic argument rages on right before his mother runs off with the local football star – is pretty much the tip of the emotional trauma iceberg that is come for poor old Russell. 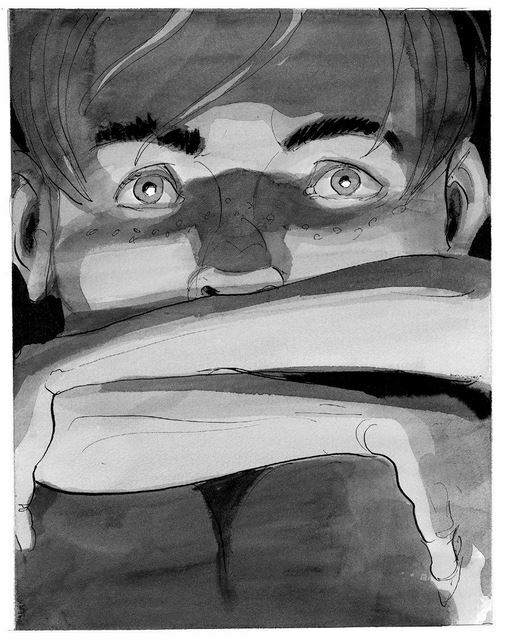 With zero in the way of a positive parental role model from his alcoholic dad either, who promptly drags him halfway across the country for a failed fresh start and struggling with his sexual identity, Russell is about learn about life for himself the hard way. 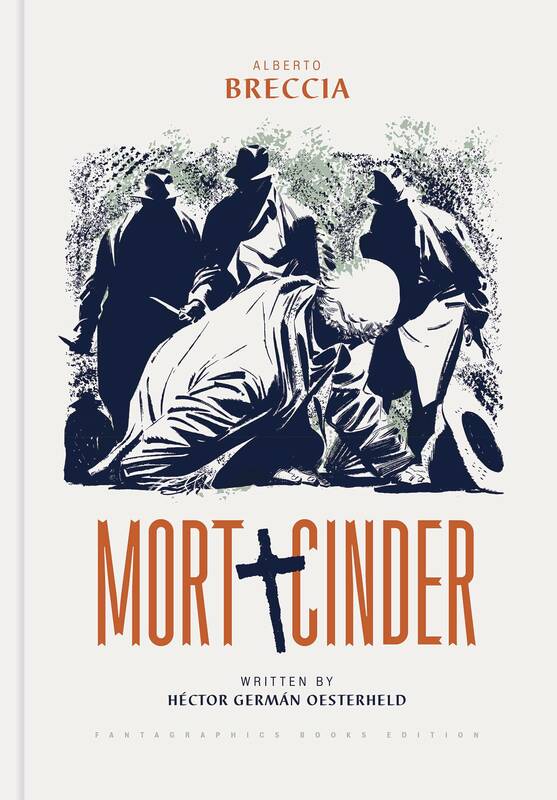 For those that like their contemporary fiction more than a little dark and troubling, and their art style black and white, with lashings of grey shading and oh so heartbreakingly expressive, this is for you. 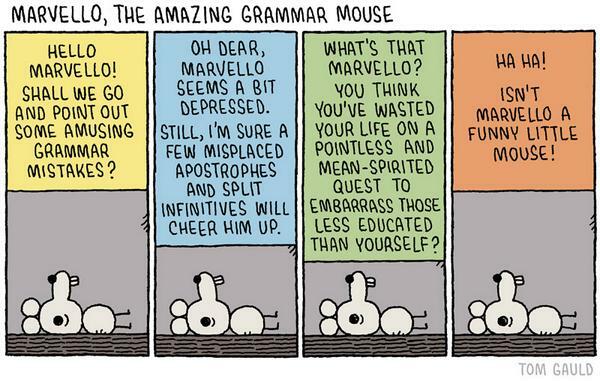 This very nearly triggered the Rigby tear threshold, I have to say. 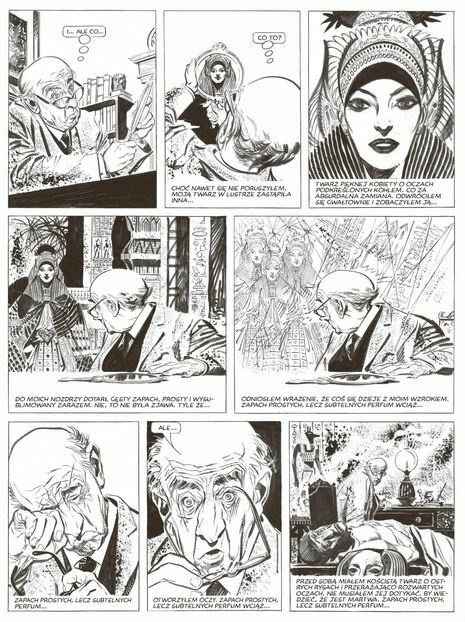 In terms of ability, Breccia’s right up there with Sergio THE COLLECTOR / SHARAZ-DE: TALES FROM THE ARABIAN NIGHTS H/C Toppi for me. 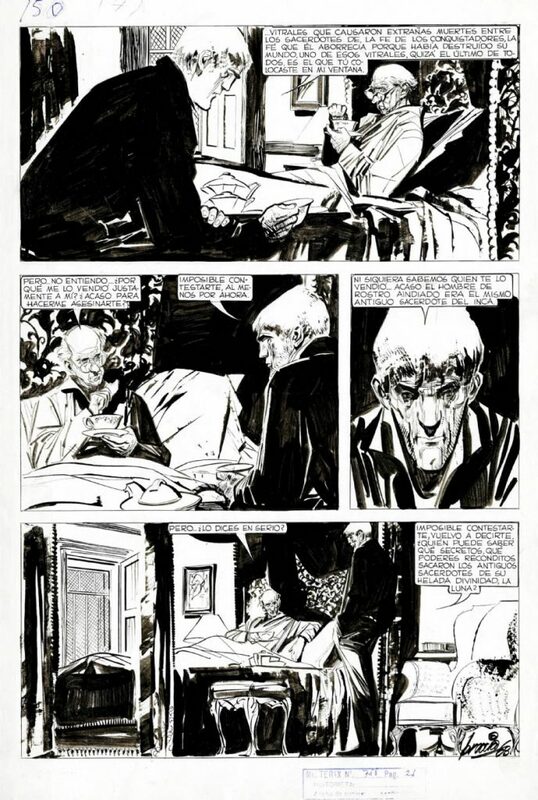 Fans of Tiziano Sclavi’s DYLAN DOG, a title that’s never really gained any traction in the English-speaking world – despite again the likes of Mignola being a self-proclaimed massive fan – would undoubtedly appreciate this. 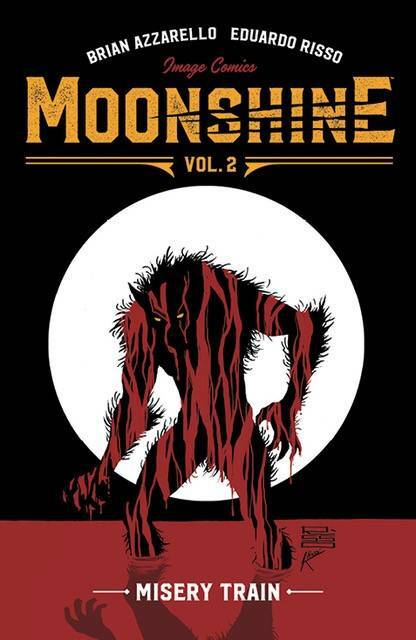 In terms of contemporary horror this is just as good as the likes of WYTCHES and HARROW COUNTY. 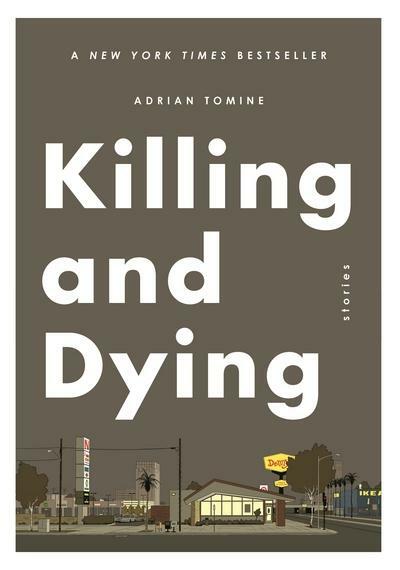 Optic Nerve: Killing And Dying s/c (£12-99, Faber & Faber) by Adrian Tomine. 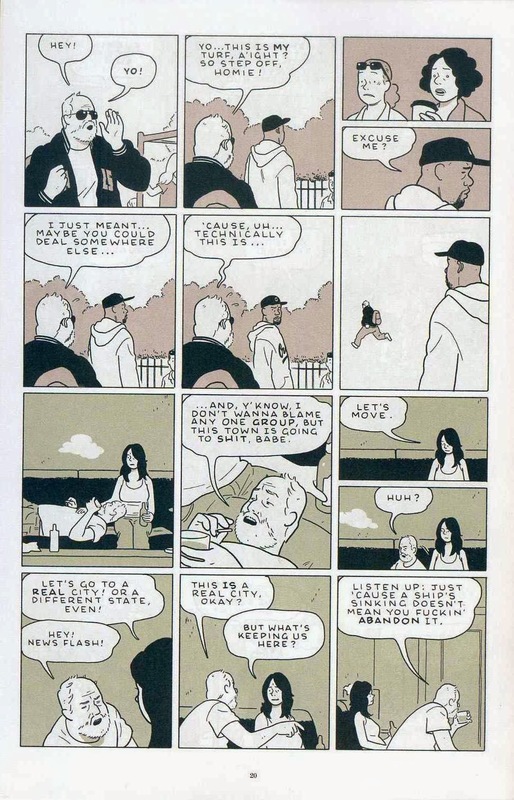 It’s an odd title for an Adrian Tomine collection, I grant you, but Jonathan and I are completely convinced it refers to the young woman who insists on performing stand-up comedy. You’ll see for yourself whether she metaphorically kills or dies there. From one of comics’ most astute observers of human behaviour – quite often rifts in relationships – this reprints OPTIC NERVE #12, 13, 14 (OPTIC NERVE #14 still in stock) and a substantially revised version of Tomine’s contribution to KRAMER’S ERGOT #7. 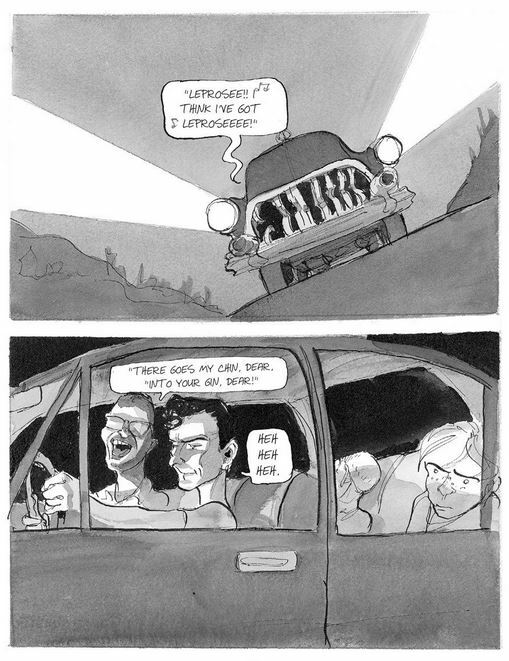 We’ve all Tomine’s other OPTIC NERVE books in stock and reviewed. Maestros vol 1 s/c (£14-99, Image) by Steve Skroce. 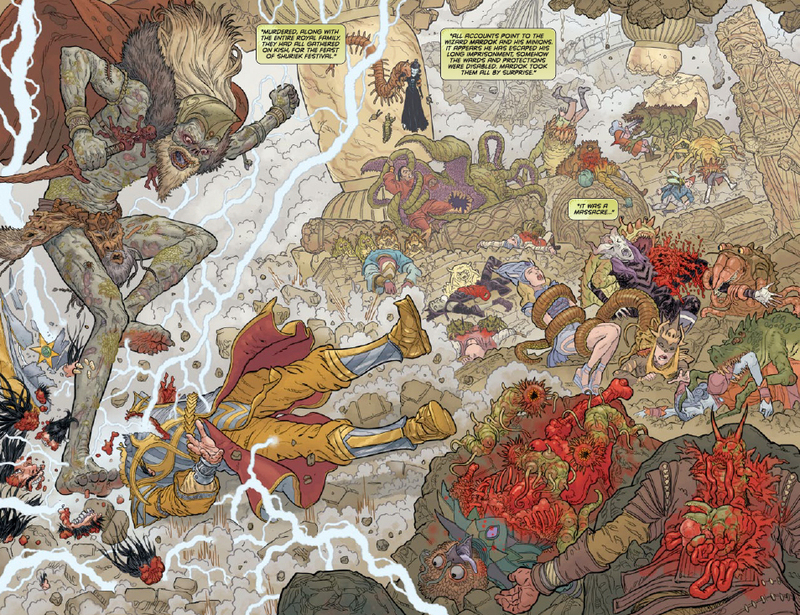 With detailed blood, guts, gore that will score highly with any Geoff Darrow fan (see SHAOLIN COWBOY: START TREK SHAOLIN COWBOY: SHEMP BUFFET, SHAOLIN COWBOY: WHO’LL STOP THE REIGN and HARDBOILED), we open with a splendid, skull-crushing, infernal massacre as the wizard Mardok and his minions stage a surprise assault on the reigning Maestro, eviscerating him, his oh so many wives, and the entire royal family to boot – those who are still residing within the Realms, anyway. After the more earthly exploits, the vast majority of this collection follows Willy’s accession to his father’s throne and all the internal – and external – politics / skulduggery that comes with it. Expect extreme and unusual forms of torture, both physical and mental. “It ain’t easy to describe the feeling of waking up in the unknown. “Being in a spot you have no idea how you got to. “It’s disorienting, a hole in the memory. 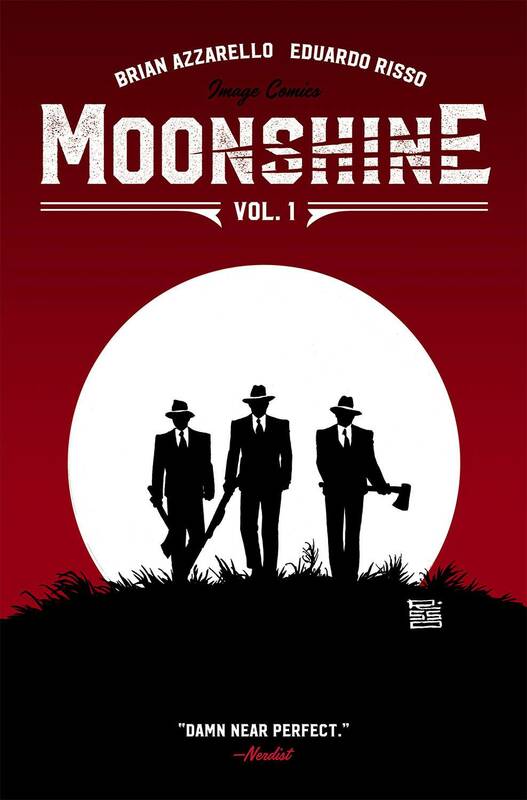 Like ‘Boardwalk Empire’ meets ‘An American Werewolf In London’. Do I really need to add anything else? Well, perhaps that it’s brought to you by the same team that produced the mesmeric, convoluted crime epic 100 BULLETS. At this point if you’re not reaching for your wallets, what is wrong with you?! 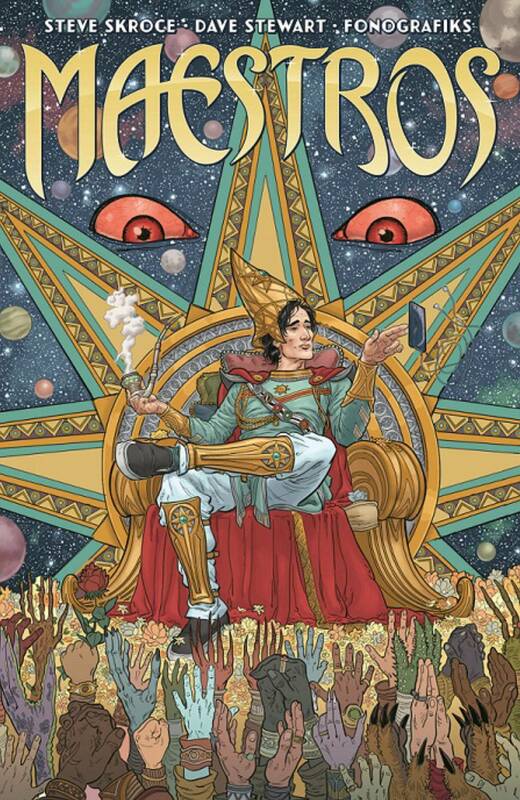 Space Boy vol 2 s/c (£9-99, Dark Horse) by Stephen McCranie. Amy and Jemmah grew up together on a mining colony way out in deep space, but when Amy’s dad lost his job, the family was forced to travel back to Earth and begin a new life there, so separating the best friends in both space and time. For Amy knew that she would spend her 30 years on the spaceship in suspended animation and, on waking up, Jemmah would be in her mid-forties and, in all likelihood, with a family of her own. 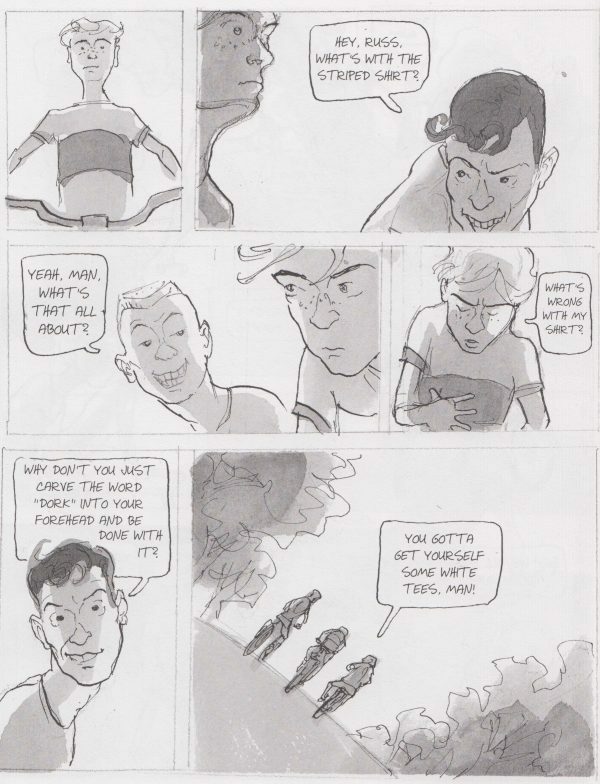 SPACEBOY VOL 1 (reviewed at length) told of that separation, so agonising to Amy that she couldn’t bear to even contact Jemmah. Instead, she gradually made new friends at a new school in a new city on the coast of a new country on a new planet. Now, can you imagine being Jemmah, and having waited thirty long years to hear from your best childhood friend again, those days drawing nearer and nearer… and then nothing? However, as I observed at the time, the title of the series wasn’t AMY but SPACE BOY, and this second volume’s cover suggests, the following, late-developing subplot is almost certainly going to come to fruition, for the deepest isolation was yet to come. Amy has synesthesia: she has always associated people with flavours, sensing different flavours “emanating” from different individuals, and for the very first time she encountered someone with none. He’s a silver-haired lad who keeps himself to himself, often skipping class, and his peers are all very wary of him. Only once did Amy sense anything other than a void, in art class, when the boy began painting, and then there was something other than a terrible, overwhelming emptiness. 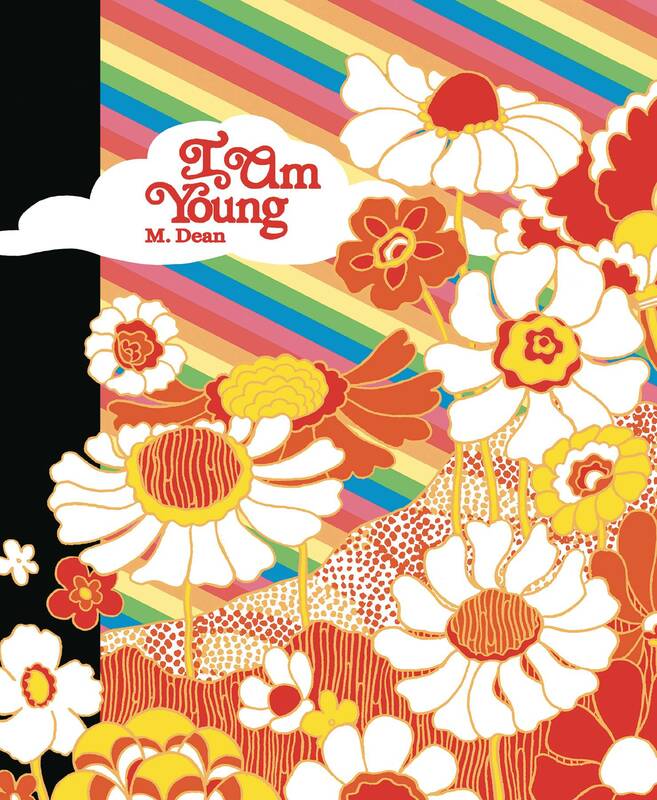 This entry was posted on Wednesday, November 7th, 2018 at 6:23 pm	and is filed under Reviews. You can follow any responses to this entry through the RSS 2.0 feed. You can leave a response, or trackback from your own site.